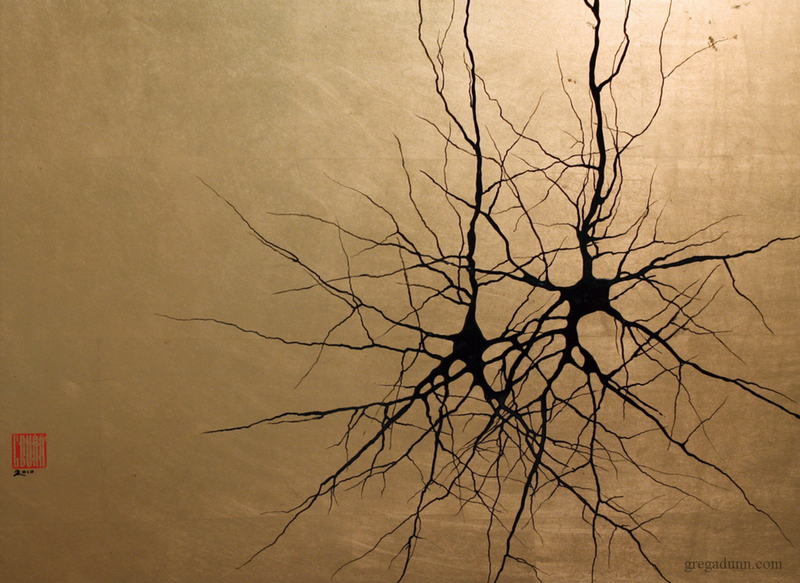 Artist Greg Dunn combines his two passions: neuroscience and Asian-inspired painting. Halfway through his PhD program in neuroscience at the University of Pennsylvania, Greg Dunn was inspired to try a new experiment: using the brain structures he was seeing in the lab as the subject matter for his minimalist Asian-inspired paintings. Dunn says that was his “aha moment,” when it occurred to him that he could combine his two interests—neuroscience and art—into one pursuit. To create a painting such as Cortex in Metallic Pastels, shown above, Dunn starts with a piece of stainless steel sheeting or metal-leafed acrylic panel. The surface is scratched, so light bounces off of it in a polarized way, Dunn says. “This allows you to control how light will be reflected.” Dunn then paints that scratched surface with a series of transparent dyes, finishing the piece with protective coatings. To see more of Dunn’s work, check out his website and the slideshow above.